The 2017 release of Jura Tastival was aged initially in bourbon casks before being split into two. Half was finished in first-fill bourbon barrels and the rest in port pipes from Graham's. Jura Tastival 2017 is the first Limited Edition release to be overseen by new Jura Distillery Manager, Graham Logan, who took over from Willie Cochrane in September 2016. “Tastival is all about welcoming people to Jura with open arms – not only to our island festival, but to our whisky - whether you’re a single malt expert or are trying it for the first time. 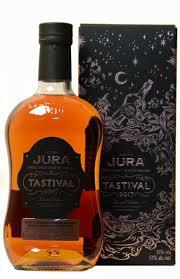 This latest Jura Tastival is presented at natural cask strength without chill-filtration. Finish: A fusion of sundried sultanas, glazed pineapple and lemon verbena.